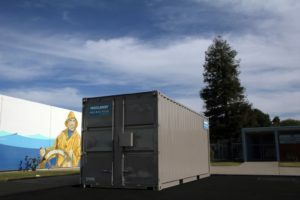 When you’re on the hunt for the “best shipping container rentals near me in Sacramento” where do you start your search? Forget the endless hours of pointless research, and consider Haulaway Storage Containers as your source. We’ve established a great reputation as the leading experts in our industry, with several locations spread throughout several major cities across the Western U.S. From our humble beginnings as a portable storage manufacturer for the construction industry to our massive multi-application use today, we’re your one stop shop for all your storage container near me needs. We believe that our customers deserve the best options available, which is why we offer our storage containers in a variety of sizes. We carry smaller units that are 10 feet long and 7 feet high, as well as larger 9.5’ high and 40’ long.. All cargo containers are constructed from high quality 14-gauge steel, and many come equipped with our foolproof patented Rhino Locking System for your peace of mind. Whether you’re planning to use a container for storage or to set up a temporary office space, the possibilities are endless. Know you’ll be working out of one of our shipping containers during the heat? No problem! Our 21’ and 26’ long construction storage containers feature double doors on both ends to allow for increased ventilation. Water resistant, wind proof, and tamper proof, you can be sure that your Haulaway Storage Container is held to the highest standard. Stop wondering, “Where can I find reliable shipping container rentals near me in Sacramento?” At Haulaway Storage Containers, we’re the number one source for shipping containers in the state of California. Even when you’re in a hurry, we always do our best to deliver your containers by the next business day. So if you value prompt and friendly customer service, give us a call today!